Background: In the energy-storage systems, supercapacitors have a wide range of applications in such as consumer electronics and hybrid electric vehicles because they are able to store and deliver energy at high rate. Nanocarbons and their composites have large specific surface area, high electronic conductivity and excellent chemical stability, promising for the electrode materials of supercapacitors. 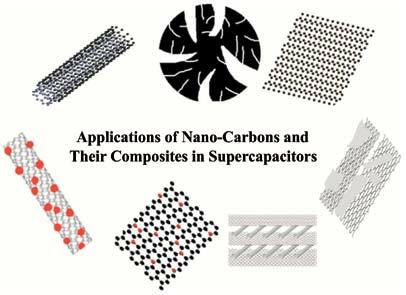 Methods: We briefly review the recent researches and advancements of supercapacitors based on nanocarbons and nanocarbon-composites. We also discussed the implications of their nanostructures on the performance of supercapacitor. Results: Based on the analysis of 127 references, this paper described the synthesis and electrochemical properties of nanocarbons and their composites such as N-doped carbons, carbon allotrope composites, metal oxides/graphene composites, sulfides/nanocarbon composites and conductive polymer/nanocarbon composites. Conclusion: Nanocarbons-based supercapacitors have good properties such as high specific capacitance and ultra fast charge-discharge rate. Because the nanostructured carbons of high quality are the key for high-performance of supercapacitors in particular, simple and bulk scale synthesis needs to stir up in the future. Exploitation of new and cheap nanocarbon-based materials with electrolyte ions accessible nanopore structures are highly recommended. On the other hand, problems from the morphology effects and aggregated nanostructures hinder the complete utilization of the nanostructures and must be solved in future work. Most importantly, understanding the relationship with nanopore structures and capacitance uptakes is urgent for the design of the practical supercapacitor device. Carbon, carbon-based material, carbon nanotubes, composites, electrode, graphene, nanocarbon, supercapacitor.